This year there are some galleries working together to bring unique presentations to abc. One which work that will be presented is by Lisson and KOW and that is Sanitago Sierra. In his work Santiago Sierra often addresses structures of power that operate in our everyday existence. Sierra’s work intervenes into these structures exposing situations of exploitation and marginalisation, famously hiring underprivileged individuals who, in exchange for money, are willing to undertake pointless or unpleasant tasks. Sierra’s work never repeats reality, but challenges it exposing its intrinsic mechanisms. The essence of the work is often in the tension generated and sustained between the event or its documentation and the spectator, who is exposed to what can be described as the formal and poetic articulation of the voice of all those who are normally marginalised or disenfranchised. For the gigantic „slide“ „World’s Largest Graffiti. Smara Refugee Camp, Algeria. October 2012“ (measuring 240cm x 450cm) Santiago Sierra created not just the worlds largest graffiti but a highly visible call for help. For the past 30 years, 10,000’s of refugees from the Moroccan occupation have been living in the Smara Refugee Camp in Western Sahara in Algeria. 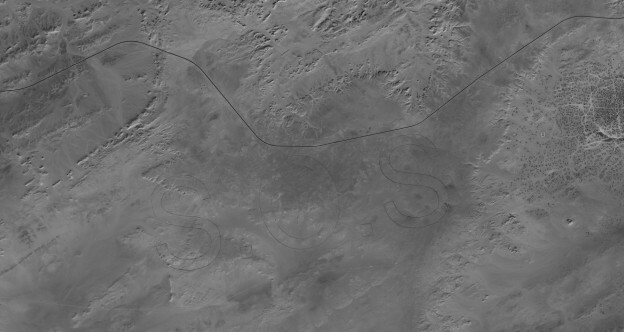 Right by the gates of the camp Sierra engraved – with the help of a road grader – a 5 kilometer long 1.7 kilometer wide SOS into the desert sand. After all UN resolutions and rulings by international courts, siding with the refugees, have been ignored, Sierra made this call for help. Seeing no help coming from terrestrial powers he chose a dimension and perspective aimed at observers from a higher point of view. In case of this image it was in view of the Ikonos III Satellite.